The dashboard settings are for the user dashboard(s). 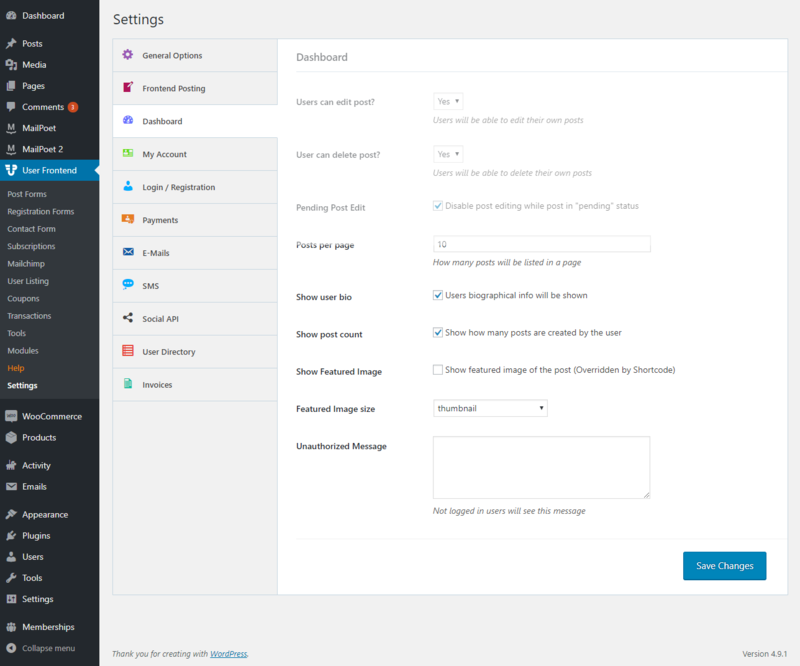 You can find it from wp-admin → User Frontend → Settings → Dashboard. Users can Edit Post: If you do not want the users to be able to edit the post once they publish the post, then you can select “No”. Selecting “No” will hide the edit link from the user's dashboard. There are 2 more edit links that are provided from WordPress. But those are controlled by WordPress itself and we have not overridden them. You can control them from user role settings. User Can Delete Post: If you do not want the user to be able to delete the posts, then you can select “No”. 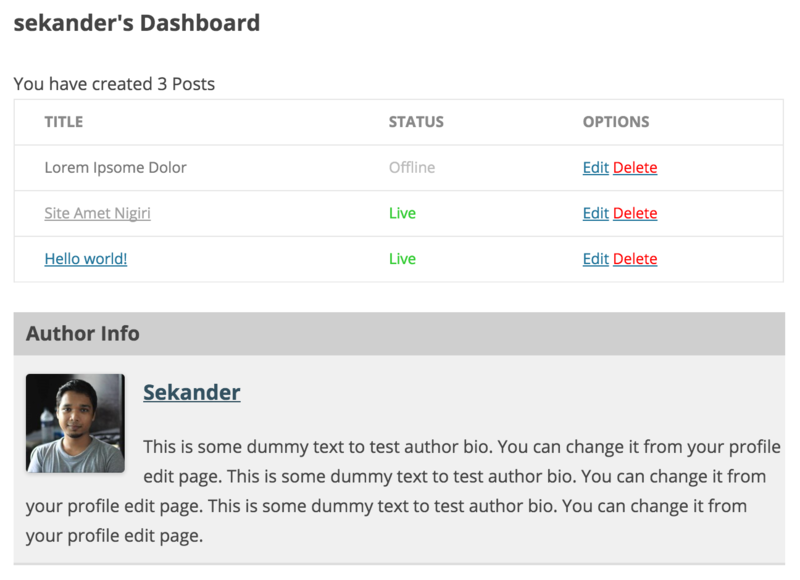 The delete link from the user dashboard will be removed. Pending Post Edit: Enabling this option will not show an edit link for the posts which status is “Pending”. Posts Per Page: The number of posts you want to list on the user dashboard page. Show User Bio: If you want to show the user's details from his profile in the dashboard page, then you can select this option. Show Post Count: You can display the total number of posts created by the user on the dashboard using this option. If you want to hide that information, you can uncheck the box. Show Featured Image: If your theme does not have featured image rendering feature, then you can enable this option to load the featured image on the post. If your theme already has featured image displaying feature and you have enabled this option, there will be two featured images. Featured Image size: This value only works if you are displaying the featured image using the above option. You can control the featured image size from here. But you can not use this option to control the featured image size which is being displayed using your theme markup. Unauthorized Message: If someone needs to login to view a page of WP User Frontend and you want to show a customized message, then you can write the message here. If you leave it blank, the default message will be shown.